Terriers visit New Hampshire for the season’s first game against the Wildcats. Puck drop at the Whittemore Centers is at 7 p.m. The game airs live on NBC Sports Network. The Wildcats are led by senior d-man Eric Knodel and junior Trevor van Riensdyk, who each have 23 points. In the goal is junior Casey DeSmith who has a 2.35 GAA in 27 starts. Likewise, BU has a defenseman, Ahti Oksanen (photo), leading the team in scoring with 21 points including 10 in his last 11 games. 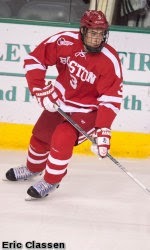 Cason Hohmann is BU's top goal scorer with nine. The last time BU was in Durham was Dec. 6 2012, when the Terriers edged then-top-ranked UNH, 3-2. Matt O’Connor will get the start in goal for BU. 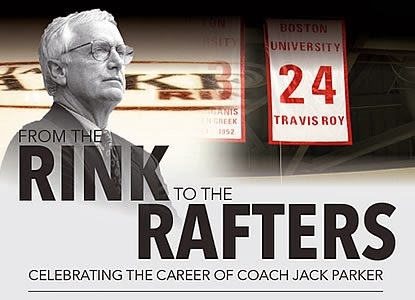 Saturday night’s rematch at Agganis Arena will be a momentous evening for the Terriers and their fans as former head coach Jack Parker’s player number—six—will join Travis Roy’s #24 as the only numbers permanently retired at BU. The ceremony will take place between the first and second periods with many of Parker’s former players expected to be in attendance. ►Boston Hockey Blog tweeted that Matt Grzelcyk started working out for the first time since his shoulder surgery. Kevin Shattenkirk assisted on a Paul Stastny goal and was plus +2 in Team USA’s preliminary round 7-1 win against Slovakia. Teamed with Ryan McDonough (Wisconsin), the Blues’ defenseman earned kudos for moving the puck in transition. 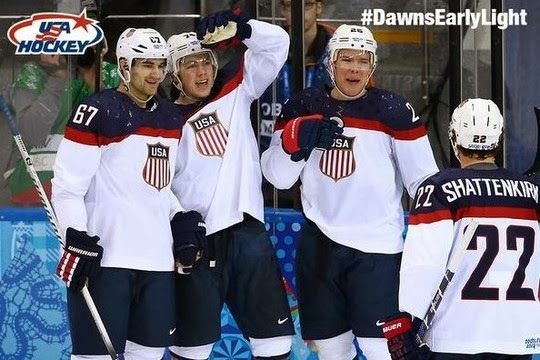 Former BU captain Mike Eruzione who scored the winning goalin the 1980 Miracle on Ice upset of the Soviet Union at the Lake Placid Olympics, tells USA Today that a win by the American team this year in Sochi would make a great sequel. If you've watched the Latvian hockey team play and heard the name Redlihs called, it's not former BU blueliner Jakabs Redlihs, but his brothers Krisjanis and Mikelis. Jakabs--the middle brother--is still playing professionally with Riga Dynamo in the KHL. BU’s 2014 recruit class features a group of forwards, each of whom has demonstrated strong skills and scoring prowess. ● Jack Eichel, NTDP U18s 25-28-53 in 33 games. Eichel leads the U18s in goals scored and has points in 27 games. As an under-ager at the World Juniors, added five points. ● Chase Phelps, Shattuck St. Mary’s Prep 22-32-54 in 41 games. USHR: “Big, strong forward with a heavy shot and a soft set of hands.” Ranked #162 in Central Scouting midterns. “AJ Greer has really emerged this season as an impact player for us, playing both forward and defense. 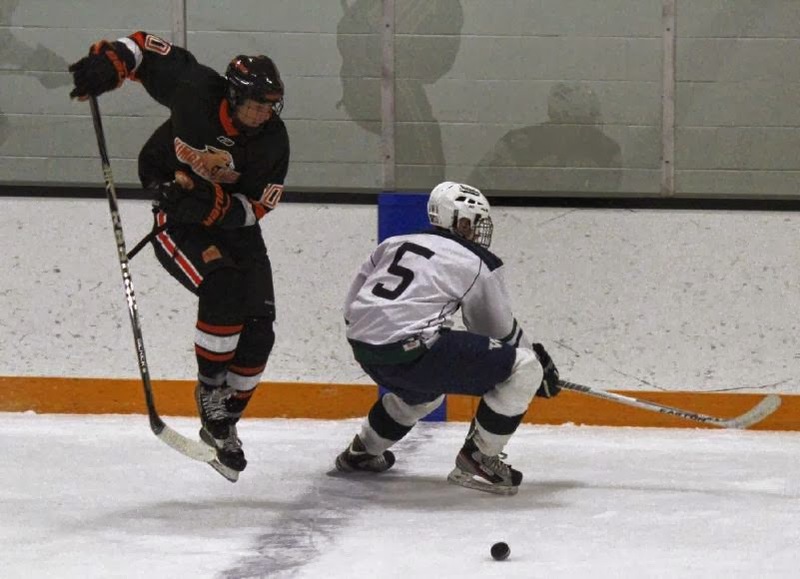 As a Co-Captain, AJ has helped lead KUA to a 20-6-5 record so far, and a first place finish in the Lakes Region League. In 28 games played, AJ currently has 21 goals and 31 assists for 52 points (1.86 points per game). Terriers begin a home-and-home series with conference rival Providence on Saturday at Agganis Arena, followed by a visit to Schneider Arena on Sunday. Puck drop on Saturday is 3 p.m. Sunday’s game starts at 2 p.m.
BU is led by the nation’s top goal-scorer, Sarah Lefort, who has 27 scores. Right behind her is captain Louise Warren, in third place in D1 with 22. With 24 points, senior Corrine Buie leads the Friars who are coached by former BU netminder Bob Deraney.